Every sound and pedagogical method of teaching reading must include two basic principles. 1. Reading must begin in the life of the child, with real thought content. Whether the thought unit be a word, a sentence, or a story, it must represent some idea or image that appeals to the child's interests and adjusts itself to his experience. 2. It must proceed with a mastery of not only words, but of the sound symbols of which words are composed. The child's love for the story, his desire to satisfy a conscious need, gives him an immediate and compelling motive for mastering the symbols, which in themselves are of incidental and subordinate interest. While he is learning to read, he feels that he is reading to learn and "symbols are turned into habit." If the child is to understand from the beginning that reading is thot getting, we must begin with the sentence, rhyme or other language unit. If a story is the initial step, a few well chosen sentences that tell the heart of the story will constitute the first black board reading lesson. The next step is the analysis of the sentence, or the study and recognition of the individual words therein. Finally the word is separated into its elementary sounds, the study of the sound symbols growing out of the stock of words learned first as purely sight words. Following this phonic analysis comes the final step, the blending of these phonic elements to produce new words. Thus gradually increasing prominence is given to the discovery of new words by this analytic-synthetic process, and less time to sight word drills, until they are entirely omitted, except for the teaching of unphonetic words. 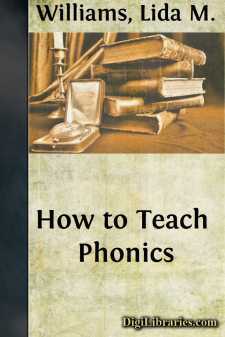 There should be at least two ten-minute lessons in phonics each day. These lessons are not reading lessons and should not trespass on the regular reading period, when thot getting and thot giving are uppermost. While greater prominence is given to the thot phase in reading, the technical drill and active effort in mastering the mechanical phase is of equal importance as necessary preparation for good reading. From the first day a definite place on the program should be given to phonics. This period, at first very short, will gradually increase to ten, fifteen or twenty minutes. To enable pupils to recognize words when separated into their elementary sounds, exercises in "listening and doing," will constitute the first step in phonics teaching. Words are sounded slowly and distinctly by the teacher and pronounced or acted out by the pupils. If at first children are not able to distinguish the words when separated thus; s-t-a-n-d, d-r-i-n-k, blend the sound less slowly thus: st-and, dr-ink, gradually increasing the difficulty to st-an-d, d-r-ink, and finally to the complete analysis. These ear training exercises should continue until a "phonetic sense" is established. Not all children can readily blend sounds and "hear the word." Patient drill for weeks, even months, may be necessary before a sense of phonetic values is attained. Haphazard and spasmodic work is fatal to progress; but a few minutes of brisk, lively drill, given regularly each day will accomplish wonders. The exercises should be varied from day to day to insure active interest and effort. Touch your n-o-se; your ch-ee-k; your ch-i-n; l-i-p-s; k-n-ee; f-oo-t; b-oo-k; p-e-n-c-i-l; d-e-s-k; sh-o-e; d-r-e-ss, etc. Place a number of toys in a basket. Pupils find as the teacher sounds the name of each, saying: "Find the t-o-p"; "the s-p-oo-l;" "the d-o-ll"; "the h-o-r-n"; etc. Sound the names of pupils in class; or names of animals; colors, fruits, places, etc. R-u-n to m-e. C-l-a-p your h-a-n-d-s. W-a-v-e the f-l-a-g. Cl-o-se the d-oo-r. F-o-l-d your a-r-m-s. B-r-i-n-g m-e a r-e-d b-a-ll. B-ou-n-ce the b-a-ll. Th-r-ow the b-a-ll to Fr-e-d. R-i-n-g the b-e-ll. H-o-p to m-e. S-i-t in m-y ch-air. R-u-n to the ch-ar-t. S-i-n-g a s-o-n-g. B-r-i-n-g me the p-oin-t-er. B-o-w to m-e. F-l-y a k-i-t-e. S-w-ee-p the fl-oo-r. R-o-c-k the b-a-b-y. W-a-sh your f-a-ce. D-u-s-t the ch-air-s. Sh-a-k-e the r-u-g. F-ee-d the h-e-n-s. C-a-ll the ch-i-ck-s. M-i-l-k the c-ow. Ch-o-p w-oo-d. R-ow a b-oa-t. B-l-ow the h-o-r-n. The pupil should now begin sounding words for himself, at first, if need be, repeating the sounds after the teacher, then being encouraged to attempt them alone. He will soon be able to "spell by sound" names of common objects in the room, as well as easy and familiar words dictated by the teacher. II. Teach the Single Consonant Sounds. b, d, f, h, j, k, l, m, n, p, r, s (as in see), v, w, g (hard), c (hard), and qu as in queer.